Intek, Inc. provide continuous and accurate metering, the RheoVac air in-leak monitor can be installed in a vacuum line between the condenser and the exhauster (e.g. liquid ring seal pumps or steam jet air ejectors). It measuring mass flow and other parameters to provide information for assessing air in-leakage into the condenser, as well as exhauster pumping capacity, which can affect turbine back pressure. Four primary variables are sensed to provide true air in-leak and total mass flow rate measurement, along with eight other gas property outputs. This information enables the user to spot increasing excess air in-leak before it affects back pressure, as well as schedule corrective action when exhauster performance degradation is noted. The unit's data can be combined with other plant data for analysis of the whole condenser/exhauster system. Continuous data archiving allows sudden changes in air in-leak to be correlated to other plant events. The microprocessor-based electronics incorporated offer a display of condenser air in-leak in SCFMs. 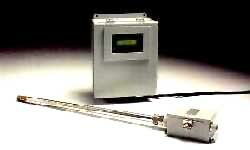 Ten measured gas properties are provided in analog and digital output signals for remote recording and display. A sensing probe comes with complete installation hardware. Products are factory calibrated under typical condenser exhaust conditions, so no field adjustment is required.